OK, this is embarrassing to admit but… I’m not a naturally tidy person. I do keep the house to a generally acceptable level of mess, but it is a big effort to keep it that way, especially with children around, and hasn’t ever got easier with practise. I’ve been keeping house for years now, you’d think I would get better with time, right? Seriously. 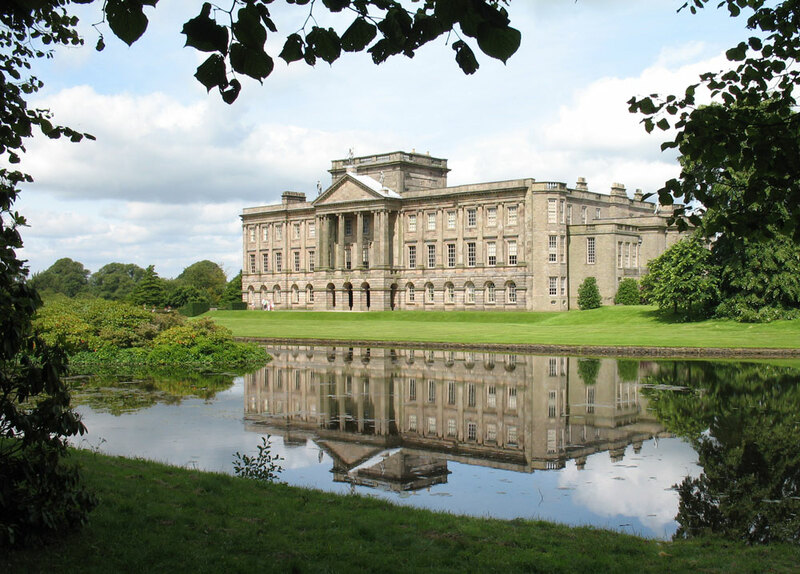 Who wouldn’t want to live at Pemberly? A little while back, I had an epiphany: Less toys for the boys means less toys for me to put away. OK. Maybe you’re smiling at me right now because you already knew this and I’m late to the party, but it worked, and cleaning up before bedtime each night became very easy. The truth that less items owned = less mess to clean up = less effort = happy me was reinforced on arriving at my parent’s farm with only what I could carry over on an airplane. I managed to keep our two rooms in good order every day, and was very proud of myself. In all this time I rarely shopped beyond groceries, however four months of general accumulating and the overwhelming generosity of neighbours, mother, friends and two sisters in giving us their hand-me-down clothes, toys and stuff meant that once again clutter was creeping in. Wanting to declutter but not knowing where to begin, I did what any self-respecting nerd would do: I Googled it. There was an overwhelming array of solutions. Tidy for 15 minutes every day! Shine your sink! Tidy up a small drawer and then you’ll do the rest no sweat! Buy my excellent storage solution for your clutter needs!! None of the advice thrown my way felt right for me. I knew that I’d never stick out the “15 minutes a day” approach, and many of the others seemed at best band-aid solutions. I knew that my goal was to own less, and so switched to researching ‘how to become minimalist’ instead. This was equally disheartening. While I admire the principle, in practise there seemed to be a ‘one-up-manship’ attitude (or should I say a one-LESS-manship attitude?) where the concept is taken to extremes and a little off-putting. I want to live more simply, but I do not want a limit of 33 items in my wardrobe. No, I do not. 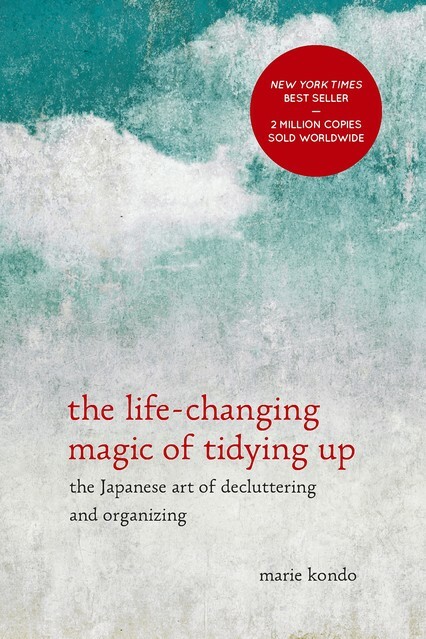 Enter Marie Kondo and her book The Life Changing Magic of Tidying Up. Before you start, identify why you want to tidy up. There must be a reason you’re reading this book, she says. Drill down and find out why you want to tidy up. For me, it was that I hated clutter and wanted a clear, simple space. I hate clutter because I can’t ever truly relax in a messy house, I feel obligated to always be tidying up instead. I realised that ultimately, I want to tidy up because I want to be able to relax and be happy in my own space. First, decide what to keep. Then decide where to put it. Could this advice be any more simple? It’s so obvious, but I realise that I found my clutter so hard to manage because I simply didn’t know where to put it. The trick to this is first deciding what to discard, after which there should be plenty of storage for what you keep. Keep only those things that bring you joy. This is my favourite piece of advice. There is no limit to the amount of belongings you ‘should’ have. Every person’s idea of the perfect space is unique so don’t force yourself to decide what to throw away, or set yourself a numerical limit based on what someone else thinks you should have. Instead, handle each item one by one and choose instead what to keep by identifying what inspires joy. If my goal in tidying up is to be happy, it makes perfect sense to surround myself only with the things that make me happy. Tidy by category, not by area. Don’t tidy one room or drawer at a time, because people don’t bother to keep the same items all in one the spot but rather spread throughout the entire house. You’ll never get a handle on exactly how much you own if you don’t see it all together at once. 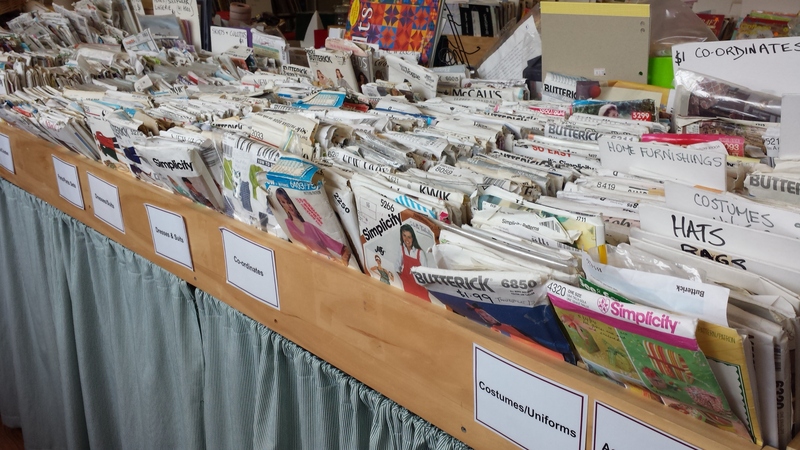 Instead, gather every single item in the same category (such as all clothing, or all books, or all CD’s) in the same place, then sort this category once and for all. This resonated with me. When moving house a while back I found enough shampoo and conditioner spread throughout the house to run a small salon. Three years later I’m still working my way through it, so I can definitely appreciate not knowing what you have until it’s all together. Don’t feel obligated to keep things that were gifts. Kondo’s philosophy is that the purpose of a gift is to express the giver’s love or appreciation toward the you and the moment the gift is received it has fulfilled it’s purpose. If you love and use the item, great! But if not, pass it on; the giver would not want to you to feel obligated, or guilty every time you see the item. This piece of advice was most helpful for my mother, who has kept years’ of accumulated gifts from my siblings and I, for fear that she would offend us if she got rid of them. This evening she salvaged the wool from the world’s ugliest scarf I knitted her as a teenager and will make something new with it. As she’s an avid knitter I know that this will bring her far more happiness than a scarf in a cupboard she’s never worn, and that in turn makes me happy. This by no means covers the extent of her method, and I highly recommend the book. It is optimistic and encouraging, and offers in turn both philosophical advice and practical solutions. For me, the greatest impact was in freeing me of any guilt about discarding an item I “might” need someday, or felt obliged to keep because someone had given to me. My wardrobe has now half the clothing it used to (and I’ve got big plans to fill it with clothing I love, through sewing, which I also love), and today I removed items from my jewellery box that I’ve owned for years but never worn. Everything else in my box now seems more accessible and precious to me. I’ve a whole house waiting to be sorted back home. Imagine a whole house where everything in it makes you happy – now isn’t that something to aspire to? I love love love these shorts! It’s funny how things turn out – I had this pattern in mind to make and some lovely burgundy suiting-weight fabric picked out from my mum’s stash. However, being a complete novice I decided at the last minute to make a “test” pair first. I’m so glad I did. The fabric is… actually, I’m not sure what it is. It is a medium-heavy weight like fabric with an interesting texture, but loosely woven so it feels quite soft to work with. It creases with wear just like linen too. My guess would be a linen-cotton blend upholstery fabric. I found it in a grimy bag in dad’s workshop under a pile of sawdust and chicken feed, and thought at the time it was so ugly it wouldn’t matter if I made a total hack job. A trip or two through the washing machine and the fabric didn’t look so bad, maybe I could even make a wearable prototype. 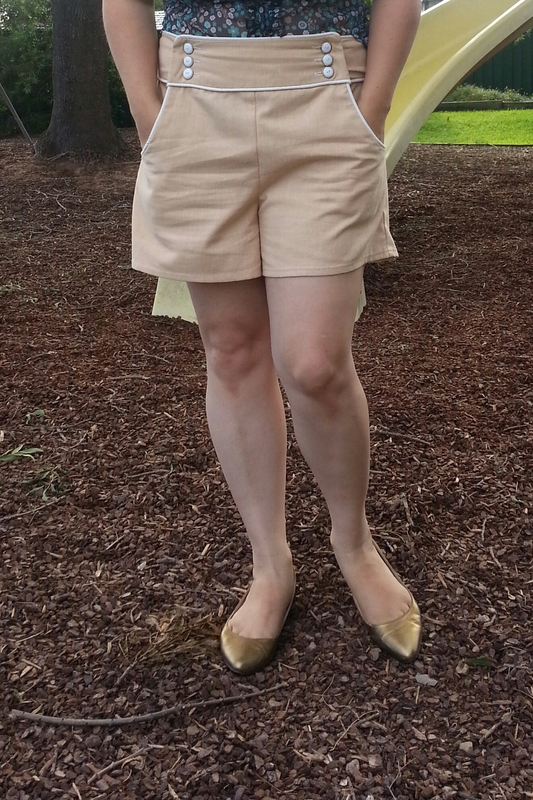 These shorts really came together when I also unearthed a ginormous roll of white piping (it’s seriously huge, according to the label there’s 300 metres! ), which I thought would be great for defining the waist band. If I knew how fiddly it would be to insert the piping in the seam I probably wouldn’t have started, but I jumped blindly in and now it’s done it was definitely worth it. I faithfully measured myself and looked at the size chart, and I was bang-on in the middle of the medium and the large. I decided to cut the large, thinking it would be easy to make them smaller if needed, but I’d be stuffed if they were too tight. Note to self: ignore the size charts and look instead at the finished garment measurements next time. I doubled the width of the darts, took at least an inch off each side seam and made a smaller waistband to make them fit, and they’re still a bit loose. I actually made these the Australia Day long weekend, and I wear them everywhere now. These photos were taken impromptu in the park with the kids yesterday. I like to pair them with a white cotton cheesecloth-y shirt and my short hair in natural finger-curls gives them a very ’20s vibe I think. Tres cool. The pockets are deep and functional, the wide waistband is perfect for avoiding any unsightly muffin-top, and the button closures make it super-easy to adjust the size if I continue to lose post-baby weight (here’s hoping). I’m definitely keen to make a few more of these, and I will do so once I get around to tracing the smaller size (I hate tracing patterns). 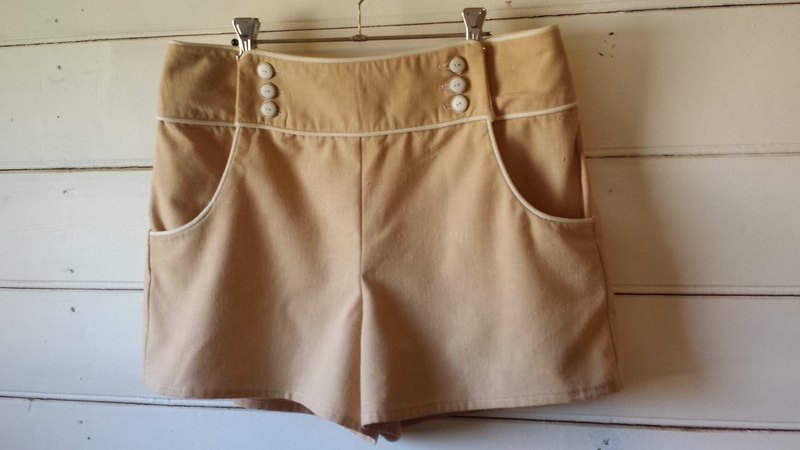 I think I’ll do my next pair in a navy twill with brass buttons, or denim with jeans stud fasteners, or a dressier pair with cuffs in black stretch cotton sateen. So many ideas! Fabric: I’m guessing a cotton linen blend, rescued from the floor of dad’s workshop. Liked: Almost everything. The fit and style are great for me and the instructions are really easy to follow. 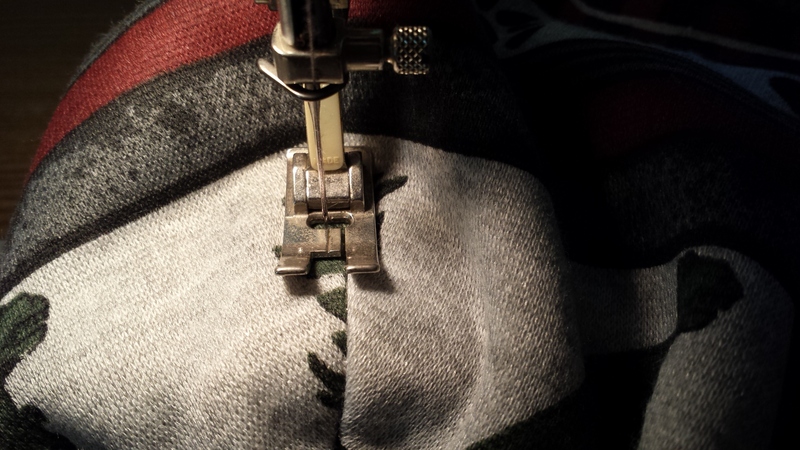 Disliked: Making buttonholes, and the size charts were way out for me. I also didn’t finish the darts well and they’re starting to open. Must fix them. I’ve learned that body size and shape don’t really matter when it comes to being well presented, and that clothing has an impact on your self-esteem. Have you ever bought an outfit that a sales assistant told you you looked great in, but felt self-conscious and lacked confidence when wearing it because you were just not sure about it? Have you ever noticed the change in posture and that little boost you get when you know that you look fabulous? The link between clothing and mindset is well established; if you want to read more I liked this article by Karen Pine, Professor of Developmental Psychology. I also learned that when working from home getting dressed in the right clothing matters. When working from home If I tried to work in my PJ’s my day would be less productive and it would be harder to get into the right professional mindset than if I got dressed and prepared for the day. Even the phone conversations were easier when I felt I was dressed appropriately. It was an effort to shower and dress myself on those dark days involving the post-baby hormonal roller-coaster and no-sleep-induced exhaustion, but I felt like I’d achieved something small when I did. You don’t have to love fashion to know that how you dress affects other people’s perception of you, and more importantly, how you feel about yourself. I’m not a very “fashionable” woman. I don’t follow the latest trends or shop for new clothes every season, and I’m OK with that. 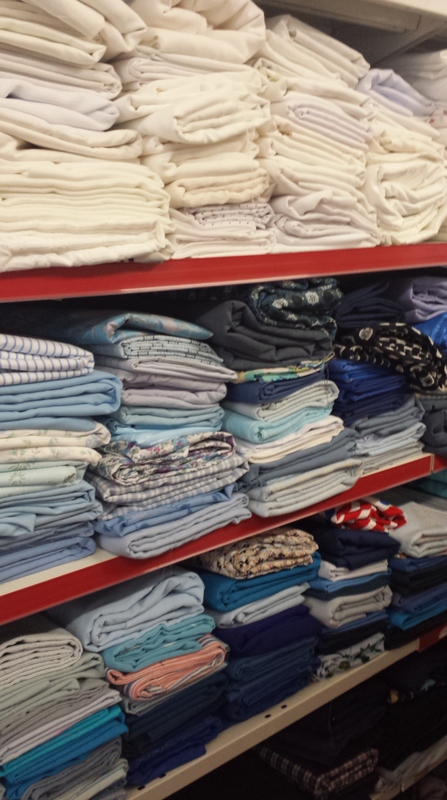 When I was growing up my parents didn’t have much to spend on clothing, so my mother would make our clothes and the rest we would get as hand-me-downs from friends at church or from op-shopping. Mum would turn op-shopping into an event and plan a day out with a few friends and a tour of various charity outlets in the area. I still have (and wear) quite a few of these secondhand gems that I wore throughout high school that I am still in love with, and will continue to wear until they disintegrate beyond repair. However, over the past 5 years I lost touch with my personal style and ironically, because I didn’t want to spend lots money on decent clothing, I spent the money anyway on lots of “temporary” cheap clothing that I had no pride in. I’ve decided that I’m tossing the old wardrobe and going back to the mix of classic and vintage style that I love, only this time I’m going to try and make the clothes myself so they fit me perfectly too. And to help break me out of the cheaply made, generic and disposable fashion mindset I’m committed to not buying any new clothes for a year. Also, I know my limitations. I’m a busy mother of two about to head back into full time work. I don’t have the time (or frankly the care-factor) to plan my outfit each day. This is why I’ve decided to build myself a capsule wardrobe of a few timeless pieces that I love and can wear for years regardless of fashion trends, and that I can throw together any top and any bottom and know that they go together. I also know that I’m not minimalist. These are not going to be my only items of clothing, but they’ll be the foundations around which everything else is built. And finally, I have been a strictly au naturel long-haired girl most of my life. But now? Things are different. I’m inspired and motivated, and what better way to signify my commitment to change than cutting off my hair? 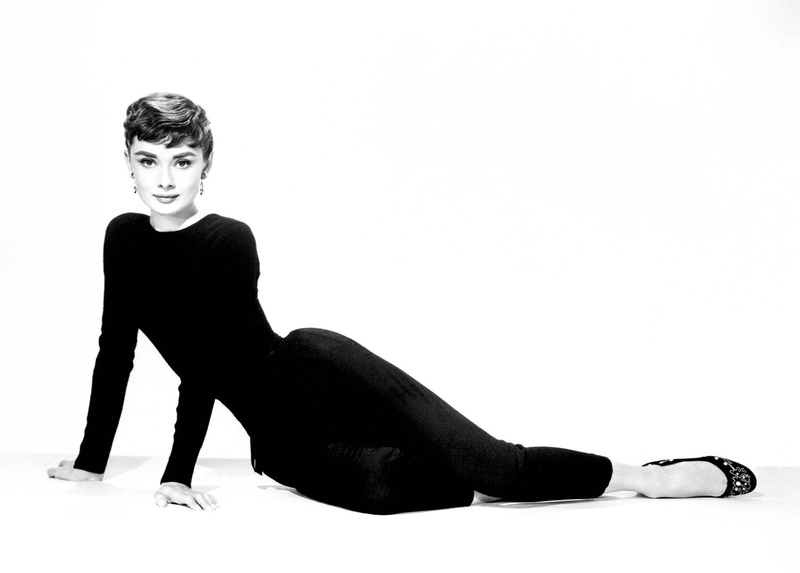 Just like Sabrina Fairchild (look at her portrayed by Audrey Hepburn above, stunning!). Such a huge change, and so liberating! Have you ever considered making your own laundry detergent? 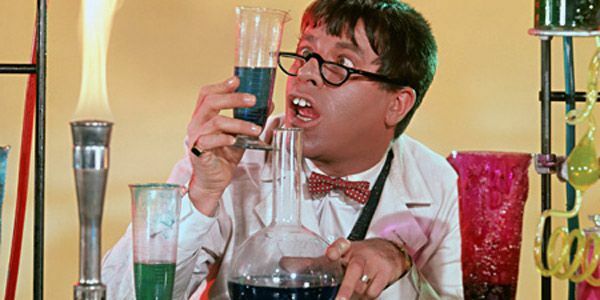 Whenever I’ve asked that question of people I’m usually met with looks of scepticism and amazement, and I imagine them seeing me in their mind’s eye in some mad scientist’s get-up. When asked why not, it’s usually because they are worried that it’s too complicated, too much effort, or that they think the detergent would be ineffective at, you know, actually cleaning clothes. Why bother making your own detergent? It’s cheap. According to the online shopping website of one of our big two supermarket chains, the cost of commercial laundry detergent ranges from $1.23/L for the cheapest no-name brand to about $13/L for well known commercial brands. I make my own for about 10c/L, from products already on the supermarket shelves. 10 cents! Total cost per L $0.13. I bought my Borax from Bunnings and bought the other ingredients on special, so for me it’s even cheaper still. It’s quick and easy to do. It takes me less than 10 minutes to make a new batch of detergent, with easily obtained ingredients, water and a saucepan. Much easier than taking two infants to a supermarket. It lasts forever. You only need a very small amount of this detergent to run a load, so I only need to make 1 or two batches a year, even with almost daily washing. It’s effective. I know this one is a bit subjective, but the detergent really does work for me. It’s kept my family’s clothes clean for nearly 10 years, and my mother-in-law is a convert (if anyone knows my MIL, you’ll know this is a tribute indeed). Also, if you are careful to use unscented pure soaps there are no perfumes or additives to irritate the skin. It’s better for the environment. I need to qualify this by stating that I’m no scientist and I haven’t had this officially tested, but I do know what goes into it, and there are no phosphates or harsh chemicals involved in making this detergent. Also, Borax is actually a recommended biodegradable alternative to household cleaners for use in septic systems. (I would caution against using Borax if you have a grey water recycling system though). 1/2 cake of soap, grated. That’s any soap. Soap is soap! I typically use Sunlight or Sard soap bars, but that’s only because I like to avoid colouring and fragrances in the detergent. You could also use an equivalent amount of soap flakes if you didn’t want to grate soap yourself. 10L bucket to store the detergent in. I actually use 5 recycled 2L juice bottles. All you need is a container with a lid. Optional extras: I like to add Tea Tree Oil for its excellent antiseptic properties (great for washing nappies) OR Lavender Oil for its fragrance and fabric softener OR Eucalyptus Oil for its fragrance, stain removal and de-greasing power (my personal favourite). Take your saucepan and put it on the stove with 3L of water (heating the water helps dissolve the ingredients). Add your 1/2 cake of soap – I use a small grater to grate directly into the saucepan. Add 1/4 cup Borax and 1/4 cup Lectric Soda and stir til dissolved. Take off the heat. Add a good slug of your preferred essential oil (remember, we’ll be diluting it down further so don’t be shy!). Add remaining water to make up to 10L and voila, you’re done. This detergent is concentrated, you only need a very small amount per load. I used less than 1/4 cup per load when we had a top loader, and for our front loader I use even less, about 2 tablespoons worth. If you have very hard or soft water you might need to tweak the amounts, but not much. This detergent tends to separate into layers when stored because there are no additives to prevent that. But that’s no problem! Just give your bottle a little shake before use to mix it up again. Easy done. Finally, this is a low sudsing detergent. Most people believe that lots of suds are needed to clean, but that’s not actually the case. The amount of foam is not relevant to a detergent’s ability to clean, but mentally we associate soap with suds, so foaming agents are often added to commercial detergents. Have you ever tried making your own detergent? Do you have any other household cleaning recipes you love to use? 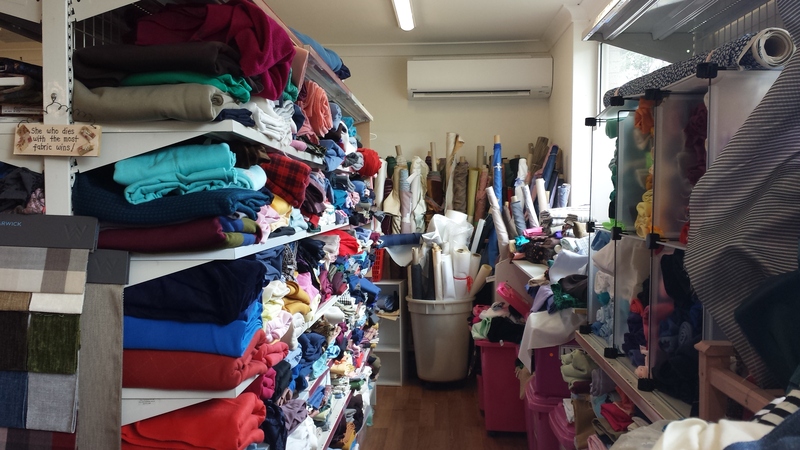 Yesterday I was contacted by Achieve Australia, thanking me for my blog post about The Fabric Cave and asking me if they might feature my blog post on their official Facebook page. The gentleman who contacted me also had a great sense of humour as he mentioned that with over 10K+ facebook friends I “might find a spike in traffic on my blog”. Uh, let me think about that – Of course YES please! What an honour! I did a little happy dance around the room, then spent the next few hours spamming the refresh button on my stats page. I fully expected it would take at least three months to gain any traction on this blog, but today I reached 200 visitors and I couldn’t be more grateful. To everyone reading this page, thank you for taking time out to read this. I’m on a steep learning curve (and still feel like I don’t really know what I’m doing), but it’s an honour to have you here with me. I had a wonderful time in Sydney, but it is so good to be back on the farm again – sleeping in an actual bed, babies in their own room, loads of space…. 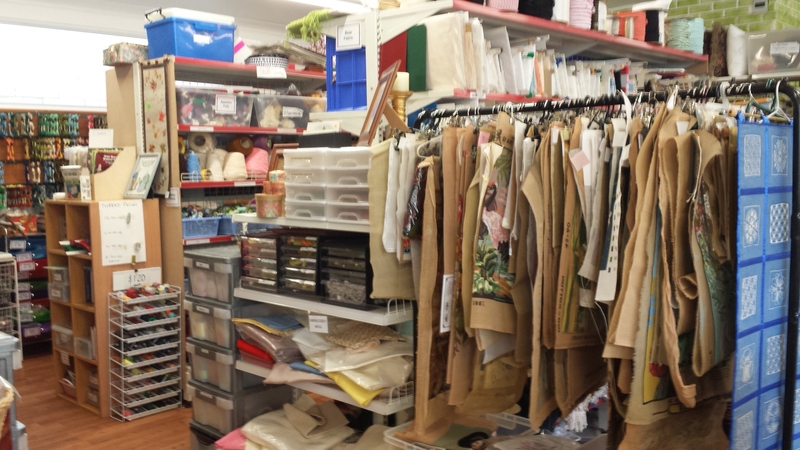 and of course, access to a sewing machine! 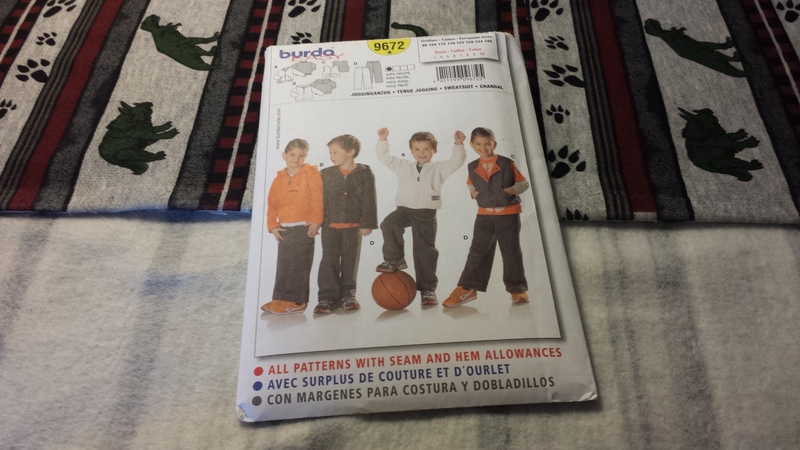 This is a pattern I’ve made a few times now for my boys, the instructions are easy to follow, and I’m familiar enough with it now to tweak the pattern pieces. I made a zip-front hoodie with no ribbing, just because I could. 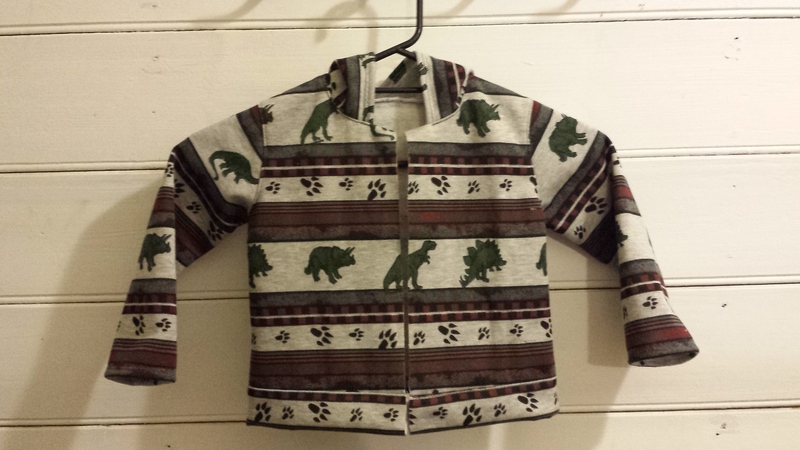 Knowing that this is going to be worn by at least two very active little boys I made sure to stitch, overlock then topstitch almost every seam to be as strong as I could make it. 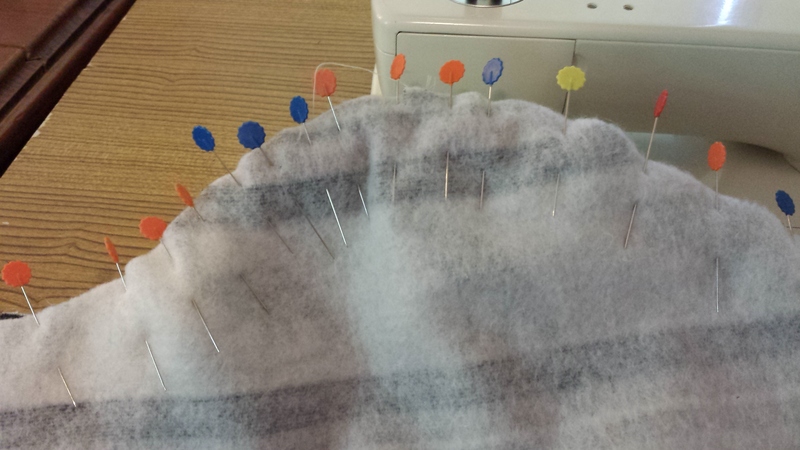 Yes, it takes me that many pins to ease a sleeve cap. It took me more than an hour to figure out the best placement for the pieces, it was a small piece of fabric with nothing to spare, and I wanted to make sure the stripes lined up. It was worth it, I’m so pleased with how it turned out. 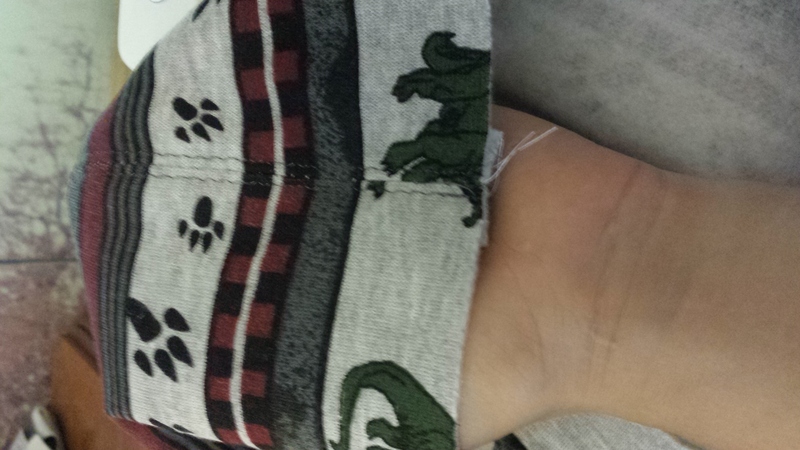 I even managed to pin a tail on the T-Rex. Win! It’s not finished, it needs a zipper sewn in and then a good press, but it’s as finished as I can make it until I go buy a zipper on my next trip into town. Pattern: Based on Burda 9672. I made a few changes to the pattern and construction, mostly because didn’t want to use ribbing and wanted a full zip-front, not a jumper. Disliked: Matching the stripes. It took me more time to place the pattern and cut out the pieces than to actually sew the thing together. 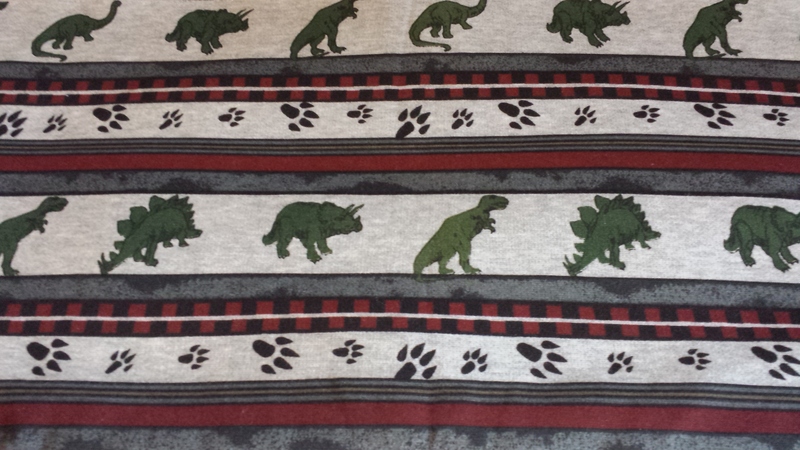 I am really pleased with the results, but I’ll think twice before choosing such a bold pattern on a little garment. Would I make it again? Absolutely. 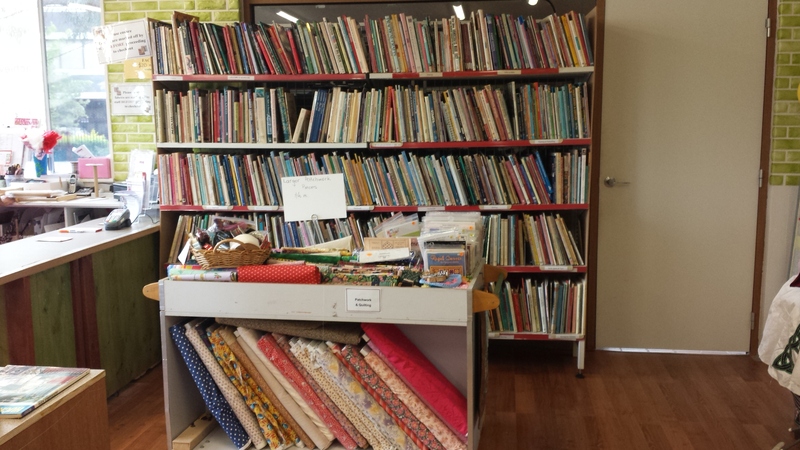 They have a wonderful selection of fabrics, notions, tapestries, patterns, yarns, books and supplies at bargain prices. I’ve only visited once but I’m already planning my next trip to Sydney around this place (insider tip – there’s a sale going to happen end of April). The shop is a community not-for-profit initiative, and all proceeds go to the organisation Achieve Australia. From their website: “As a not-for-profit community organisation, Achieve Australia has provided services and support … for people with a disability to achieve a life that is meaningful and valued.” I think that helping others live their lives with dignity is a wonderful cause. 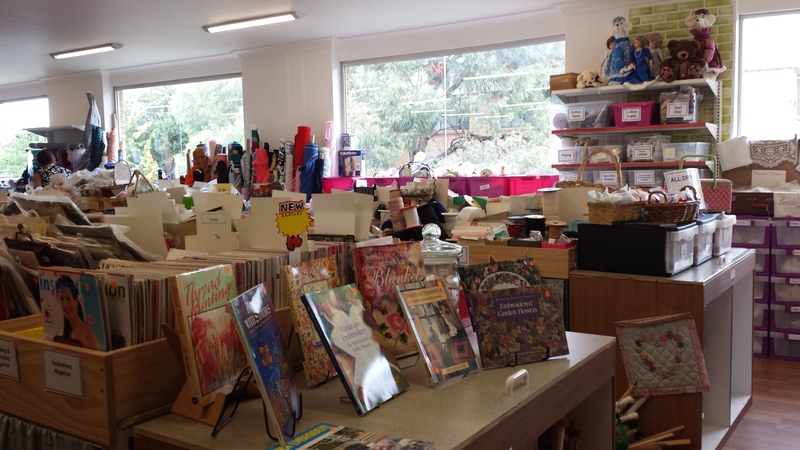 Their shop is stocked with donated goods, and run by some of the loveliest staff you could meet, and what’s even more lovely is that they’re volunteers. If you’re in Sydney and would like to stock up (or de-stash and donate! ), please please pay them a visit. No Clothes Shopping for a Whole Year? I recently came across Pareto’s Principle as it applies to clothes: that 20% of the items in your wardrobe are worn 80% of the time, and I’d say that’s a pretty fair estimation of my own circumstances. After my marriage I slowly crept up a few dress sizes, and as I had no intentions of staying overweight I didn’t make any effort to dress or shop discerningly; I just grabbed whatever was vaguely my size from the specials rack once or twice a year to tide me over until I could fit into my “real” clothes again. 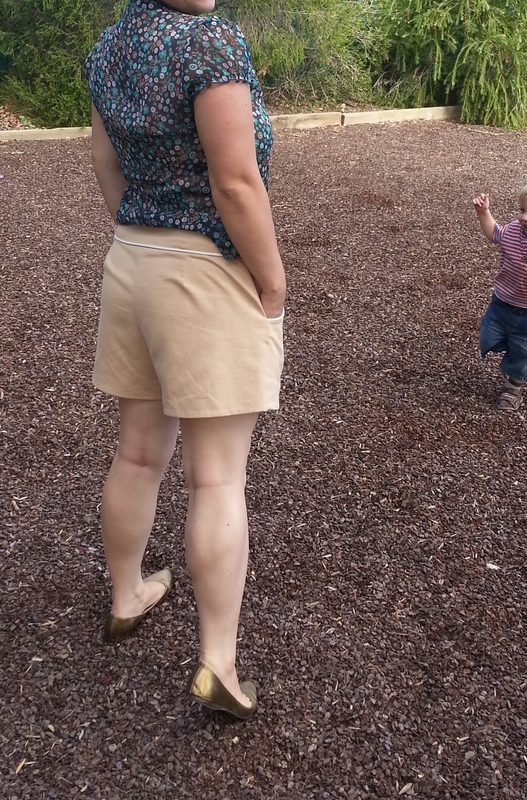 Add to that two pregnancies in two years and the logistics of breastfeeding meant my clothes were all BLAH. When I flew interstate to visit my parents I was limited to only what I could carry in a suitcase for myself and two babies, and babies need a LOT of stuff. Everything I brought for myself was able to fit into a carry-on, and I found that over the last three months I haven’t missed having more items at all. In fact, I found dressing infinitely easier without the paradox of choice, which led me to explore the idea of a capsule wardrobe (but that’s a whole topic in itself). I’ve never been one for new year’s resolutions. I’m generally incapable of finishing anything I start so I figure it’s easier just to not make resolutions in the first place. But this year I’ve made a resolution to buy no new clothes for myself, or my two boys. No new clothes in a whole year, other than what I can create with my own two hands. Considering I sewed the first ever item of clothing for myself less than three months ago, I wonder what I’m getting into, but I was always one for jumping right in the deep end! So far I’ve stuck to this resolution, even when my sister-in-law took me shopping at one of Sydney’s biggest factory outlet centre earlier this week. SO proud of myself! Do you have any new year’s resolutions that you’re (still) keeping? These were the words spoken to me just this week by a random stranger met in a fabric store, and it was exactly the final little push I needed. The past nine months have been a time of great changes and new ventures for me, and I have on more than one occasion considered diarising these events. And so, I will squash my fears of technology (how exactly does one blog? ), and inadequacy (what will I have to blog about? ), and throw myself into this new adventure. 18 months ago my mother bought me my first sewing machine. I don’t know what prompted her to do so, I’d never displayed any interest in sewing before, but in her infinite wisdom she decided that in the moments between caring for a new baby I needed a hobby and sewing it must be! 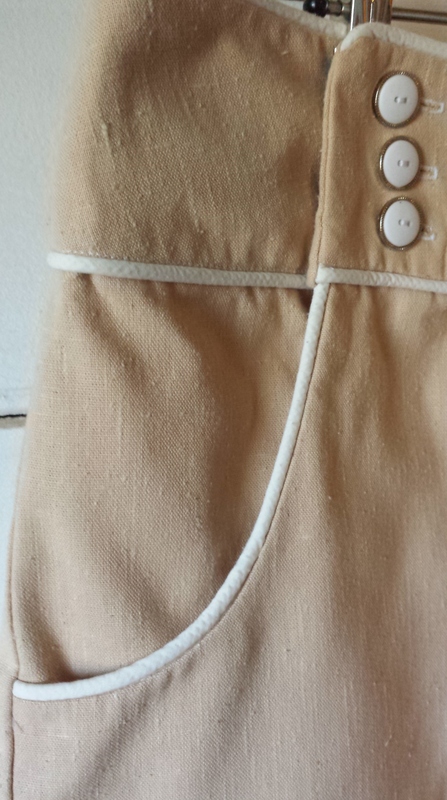 I started using said sewing machine as a shocked reaction to the price of baby gear ($40 for a basic cot sheet set? $30 for a single onesie in the supermarket? REALLY?). Surely it can’t be that hard? And you know, it wasn’t. I started with sheets, then quickly moved on to sewing my baby’s clothes, bibs, soft toys, cot sets and blankets, nappies (diapers) and bags; I also became addicted to craft blogs and tutorials, and purchased more patterns than I know what to do with! 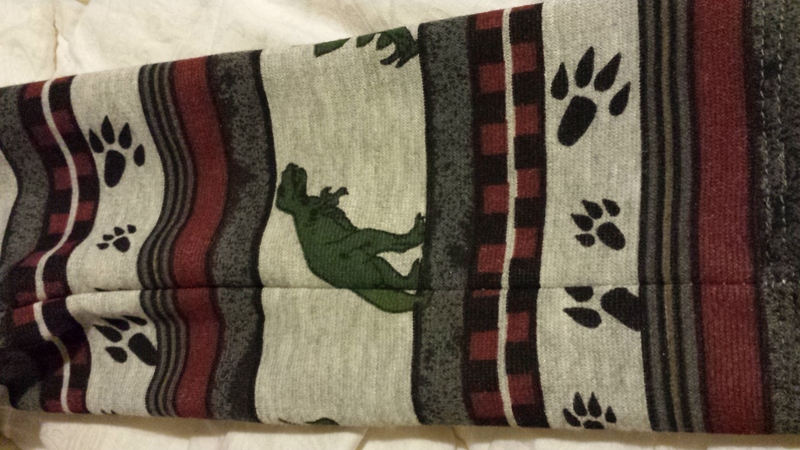 I discovered a love for sewing that I previously never knew I possessed. A brief fling with selling things on Etsy then followed, until (boom, hello!) I fell unexpectedly pregnant again. Two days before my second child was born my husband and I unexpectedly found ourselves both without work, which was the catalyst for major life changes. We decided we would see this as a time to enjoy our newborn babe and our time together, and a rare opportunity for a tree change. Fast forward nine months and we are on an extended visit with my parents in a gorgeous little farm house in the middle of nowhere, enjoying space, quiet, our two gorgeous boys and most importantly each other. I am grateful for the stress-free atmosphere, it’s exactly what a tired mother of two under two needs, and I have been so happy and content these past three months it will be hard to return to my full time corporate life. 1. Live move simply with less. 2. Push my limits and sew an entire wardrobe for myself. 3. Improve myself with study and consider what I really want to do for the rest of my life. I firmly believe that it doesn’t matter if you don’t know what you want from your life, as long as you keep growing and learning and don’t hang back waiting for life to happen. Go get ’em. PS I ran this blog post past my sister, and I now know that me getting a sewing machine was just a serendipitous mistake – my sister had been asking for a sewing machine and mum bought it for the wrong daughter. Isn’t it funny how a chance mistake like this can have such a profound effect on your life?